Christine McPherson (Saoirse Ronan) is a senior in high school in Sacramento, California in 2002. She does not like her name and gave herself the name Lady Bird. She signs as Christine “Lady Bird” McPherson. Her mother (Laurie Metcalf) is a strong-willed person but not very good at being a mother. She routinely and methodically puts down her daughter, denigrates her, and shows her with actions and words that she does not respect her. Yet, as mothers are wont to do, she loves her, and Lady Bird desperately needs her approval. Her father (Tracy Letts) is a computer programmer who lost his job. He is passive, beaten down but he loves his children and wants their best, yet, he knows he can’t help them. He suffers from depression. There is also her brother and his girlfriend who live with the family in the little three-bedroom house that the parents bought 25 years ago and never dreamed they would be stuck in all their lives. 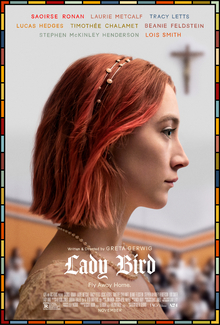 Lady Bird copes with coming of age in a depressed family, during an economic downturn, desperately trying to have good friends, first love, and a future at a college in New York that will cost much more than her mother can afford working double shifts as a nurse. But life does not cooperate, at least most of the time. The movie Lady Bird plays in Sacramento, California. I have, through my work, visited Sacramento often over the last two decades, and there are many scenes where I recognized the background down to the camera angle, particularly at the airport, and by the Tower Bride near Old Town. Sacramento looks romantically beautiful in this movie, much more so than it ever did to me in the real world. I enjoyed how the cinematographers pulled out the beauty and mood. This film is the debut of director Greta Gerwig. It reminded me a bit of the 2008 movie Juno, another story of a young girl who asserts herself in an adversarial world. With a score of 100% on the Tomatometer, you probably should not miss this film. It makes you think, it makes you remember your own youth and how hard it was to be accepted, to go your own way, and to overcome your own family and the yoke it can put on you. Lady Bird is a really good movie. I am going to be looking out for Lady Bird. Thanks for the recommendation.